I'm kinda slowing down a bit these days but it's been nice. My brain needed a little break. Oh yes I've still been cooking, duh, girl's gotta eat no? But I haven't thought about taking pictures and posting recipes. Consumption comes right soon after cooking complete. It would happen a split second earlier if I didn't have to call hubby to the table. Alas, he gives me a little break, to walk from the kitchen to the bottom of the stairs, where I (quietly) yell to COME N GET IT! Saunter back into the kitchen, pour us some tea, and sit at the table and wait. And wait a bit more. Optimal time to take pictures I know, I just...haven't ya know? Because I'm on a (brief) mental break. Not so good the week of Thanksgiving. Even worse the week before the GRE and 2 weeks before finals! Thanksgiving is Thursday but we are having it today so we can volunteer Thursday. Even with bird in oven at the moment, I'm not finding that happy place to get up and cook, what up with that? So not me. 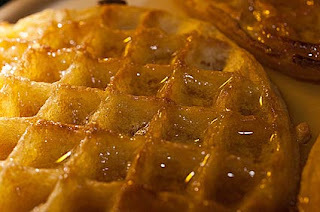 My copy and paste doesn't want to work, click the above link to find out about this horrible shortage of eggo waffles. :( Sad day indeed.